Intel is the market leader when it comes to SSD. Their technology modernizes data center storage with breakthrough performance that brings extreme data throughput directly to Intel® Xeon® processors with up to six times faster data transfer speeds (NVMe). Intel SSD en NVMe have proven quality and reliability. Uncompromising qualification and compatibility testing ensures a highly reliable SSD. Uncompromising performance and storage capacity. Up to 4.0 TB PCI Express Gen3 and up to 1.6 TB SATA SSD. 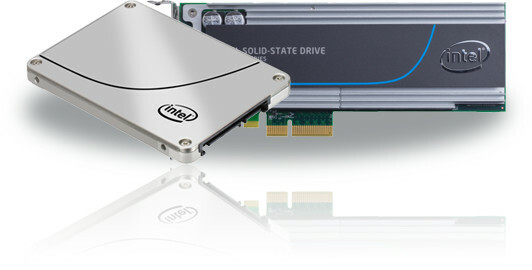 With Intel SSD you can reach up to an astonishing 850,000 IOPS random 4KB Read/Write. Order directly from our webshop, or contact us for more information and consultancy. Being Intel Platinum partner means that we have the right knowledge & expertise to ensure that our customers get the best possible configurations suited for their needs. You can always contact us for more information, advice and pricing.